Did you checkout my new video on Skincare Haul ft Greenberry Organics? I’ve recently started to upload YouTube videos more often as well. Since I got my hands onto so many jars of goodness from GBO, I decided to share my experience with each one of them for you guys. Starting off with GBO series from today, I’d make sure to release reviews, especially of newly launched ones as soon as possible. So without more delays, let’s begin with the review. In case you are interested in subscribing to my YouTube Channel; click HERE. Description: Say goodbye to those severe tanning issues that persist throughout the year. 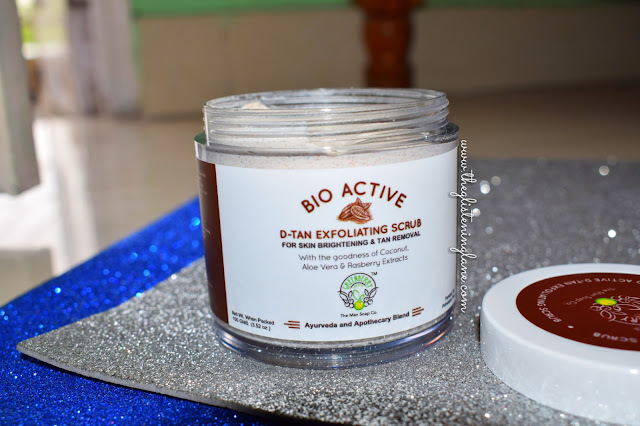 Get to the beaches and in the water with confidence because you have the all new Bio Active D-Tan Exfoliating Scrub with the goodness of more than 5 Bio Active Ingredients combined together to provide instant tan removal and gives your skin a brightening effect. 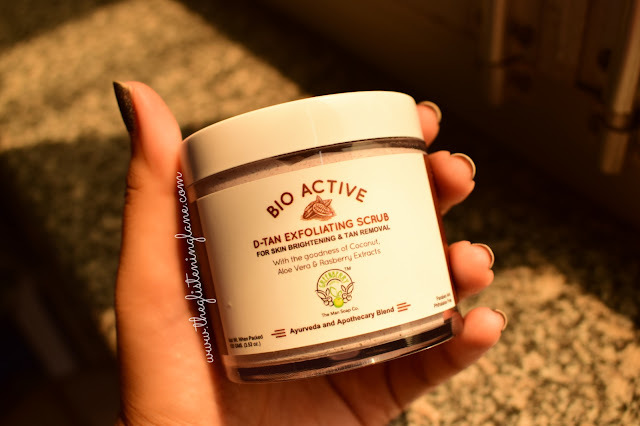 The natural ingredients act as a deep exfoliator on your skin's top most layer removing the tan as well as other harmful bacteria that enter the skin through tanning and harmful UV rays. Note: The product contains 100% Natural ingredients. May cause slight irritation to some. Patch test recommended. Natural products may have seasonal colour and property changes. Store in cool dry place. Keep out of the reach of children. Not to be used internally. If contacted with eyes, rinse with cold water immediately. Buy Online: You can order yours at a much discounted rate from HERE. Scoop out a little amount of the scrubbing content from the jar and start applying onto the desired area. Make sure to rub into circular motions with a gentle hand for 1-2 minutes. Wash it off with water; preferably cold water. You must be wondering why cold water I say. In order to get rid of clogged pored and blackheads (that is before you begin to scrub) that’s when the congested pored need to be open. This is why, a lot of the skincare experts suggest getting a steam which works miraculously well for getting rid of any gunk within the skin. But after the scrubbing has been done, the task in hand remains to be of closing the pores immediately so that the pored do not become vulnerable for being clogged again. Thus, use cold water while washing off the remnants of the scrub. Cold water is known to close down the pores and you can also use ice for the same purpose. What I like about Greenberry Organics packaging is that they have colour coded each product based on one of the crucial key ingredient endowed within the products. This makes it easy to identify the tubs/jars if you have more than one lying within your vanity. The jar is made up of transparent mirror look alike plastic and a lid which opens upon rotation. I think within past, I’ve got one of their masks wherein the lid failed to close properly after one or two use. Thankfully, it isn’t the case this time. Also, there’s a plastic stopper sort of additional sheet which protects the content from sticking onto the lid and making everything messy. 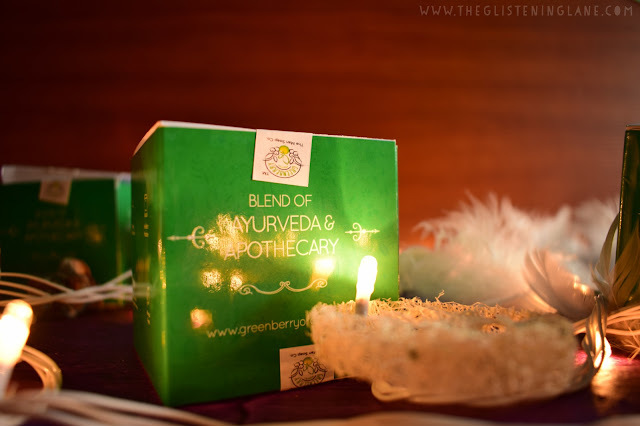 In case you didn’t notice, Greenberry Organics has now started to incorporate an additional layer of mono cartons which gives a lot about brand details. The mono carton has a paper seal as well at the opening of mono carton, which makes ensures that the product you get is completely brand new. One thing which I would suggest to the brand concerning mono carton is probably to release different cartons for each product so that it doesn’t turn into hassle to open the carton and see each time which one has which product's jar inside. You guys know by now that my skin is oily and prone to acne; which is why most of the times I have a minor bump or two. Because of these bumps, I can’t really look up to scrubs for improving my skin’s texture. There are very rare chances when my skin remains acne less completely & this experience lasts only for a day or two. Within these exceptional days, I resort to scrubs that aren’t too creamy. The problem with scrubs is - the manufactures believe that to counter the abrasiveness of harsh granules, a cream formulation would balance out the things. But being a person with oily skin, I detest cream based products. This is why, I legit use no day or night cream within my skincare routine. Scrubs with gel base are what work wonders for my skin. 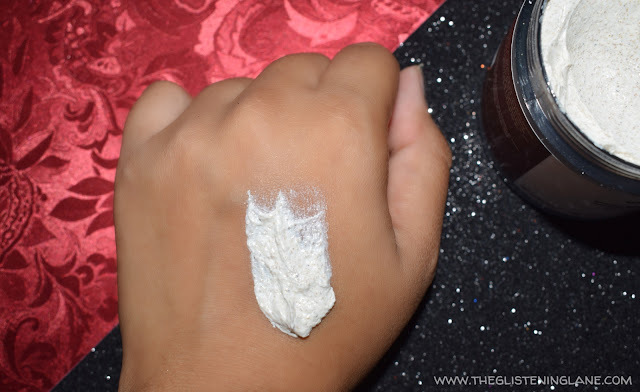 For that matter, even powdered cleansers are good due to the fact that I can customize them as per my skin’s need. 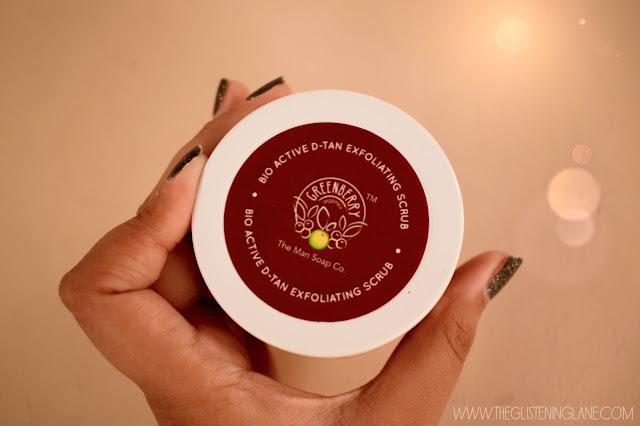 When I saw GBO’s De Tan Scrub being launched, I was curious to try it out; yet at the back of my mind was the fear of getting a cream based exfoliator. When I unboxed the product, I did see cream base within this scrub; but did it work well for me? Remain glued till the end of the review to find this out! 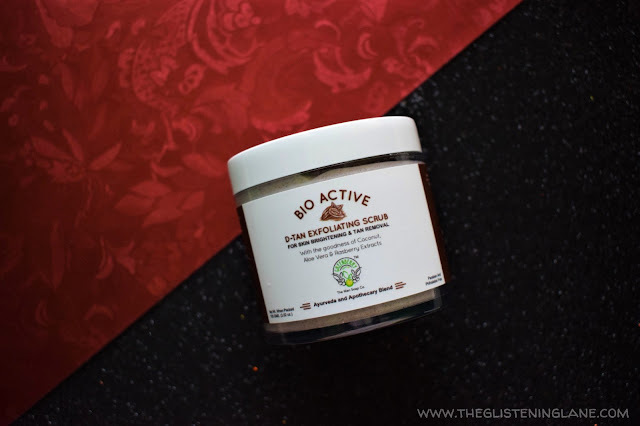 *Suspense Heightened* The fragrance of this scrub is more onto the herbal side. I can find resemblance of the smell but can’t recollect what exactly it smells of. Trust me not when it comes to describing fragrances. My nose only has speciality is to discover if my mother made pulao tonight or not! *LOL* If I talk about the scrubbing granules, I must disclose that they are pretty much milled and small; and hence not harsh onto the skin. On my first attempt, I used a small amount of the scrub and massaged it in circular motions onto the wet skin; amidst the shower time. 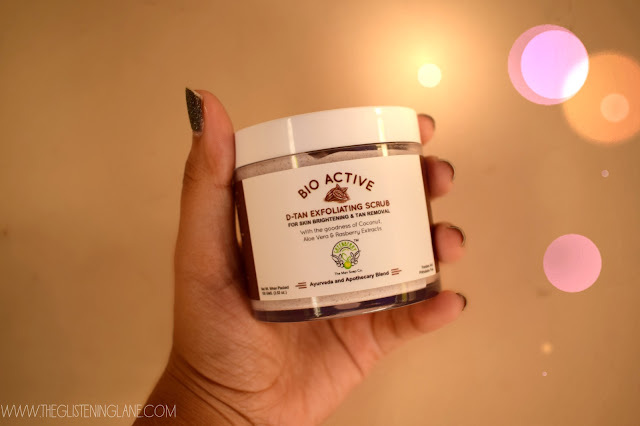 What I liked about the formulation of this exfoliator is that – though creamy, it isn’t super creamy which causes unwanted sweating onto my face. 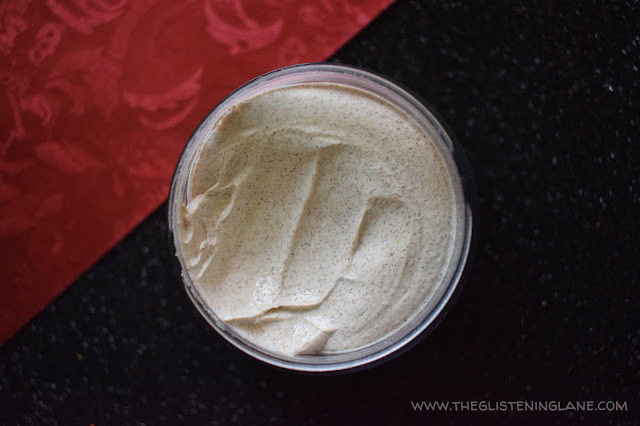 I used it for roughly 2 minutes and the immediate results were radiant, glowing and soft skin. There was a slight difference onto my skin’s tone as well. Post sweating, my face does look slight tanned and this tanning is mere temporary which evades as soon as I wash off my facial skin. In case you still don’t prefer cream based scrubs, you can use the trick which I’ve always employed. Instead of washing your face and then exfoliating the skin, reverse the order and you’d realize how the face wash would take off excess hydration off your face. Do let me know within the comments down below if you’ve tried or liked this little hack! ▶Makes the skin radiant, soft to touch and freed of gunk. ▶Helps in removing the tanning by exfoliating the old skin cells and enabling new skin cells’ production. 👉Slightly pricey but you can obviously get it online at discounted prices! In case you have normal to oily skin and you don’t want any scrub that leaves a lot of unwanted moisture onto your face, then go ahead pick this one! The granules being small, makes it apt for being used as both a body scrub and a facial scrub. Who doesn’t prefer products which can double up to end your tension of getting two different ones? Nice review. Does it help in removing tan? Sounds like a good product. I'm yet to explore this brand, so which one product would you suggest as must try product?